It is Friday (hooray!) and time for a brand new Playing in Paradise Challenge at Scrapbooker's Paradise (hooray!). As always, there is a fun prize up for grabs! All you have to do to be in for a chance is make a new project following the theme. There are no product requirements and you can make whatever you like. As soon as I saw this sketch, I thought of my cute little Penny Black 'Eat Cake' set. It has the perfect image. Stamps - Penny Black Eat Cake stamped on 300g hot pressed watercolour paper with black Stazon and coloured with distress inks (weathered wood, stormy sky, fired brick, antique linen, frayed burlap, scattered straw, black soot, peeled paint). After colouring, I went over the balloons with my clear Copic Atyou Spica pen to give them a little shimmer. I loooooove this pen! Sentiment is from the same set and embossed with black embossing powder. This set is no longer in stock, but if you are a Penny Black fan, you can check out the selection available here - there are quite a few on sale!! Other - doily, balloons were handcut from Bazzill and coated with Goosebumps shimmer spray (gives some dimension and really shines and sparkles). I dipped some twine in fabric stiffener and wrapped it around the goosebumps bottle to dry most of the way to give it a wonderful curled shape before tying it onto the balloons. If you are looking for more ideas and inspiration, then be sure to pop by my team mate's blogs (links are in my side bar) to see their beautiful projects. 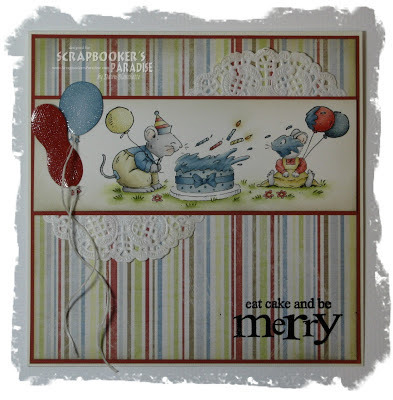 Then pop on over to Scrapbooker's Paradise to play along. I hope you will join in and I am looking forward to seeing all your wonderful creations! It sounds like your weird weather has been like ours - from extra-cold to unseasonably warm. We had a 24 degree change in less than 24 hours. Yuck! This is gorgeous Dawn. I love the cute image and your colouring is wonderful. The doilies and papers are fabulous too. LOL! Dawn, this is a darling image! Love the frosting on the party-goers little face. (yummy! LOL) Typical of a boy-child to be full of hot air like that LOL Your balloons are cute, too! I especially like your take on the sketch by cutting the doily in half like that. So, so cute Dawn! I'm looking forward to the weather this weekend too. Hope it lasts for a wee bit! Love your little mice stamps. My older sister has a collection of mice. She loves them. Of course,she has probably never had a live one in her house. I only think they are sweet on cards. I've had too many in house to be sentimental about the real deal. Thanks for this. Keep smiling and creating. Ooh, I love how you have interpreted this sketch. 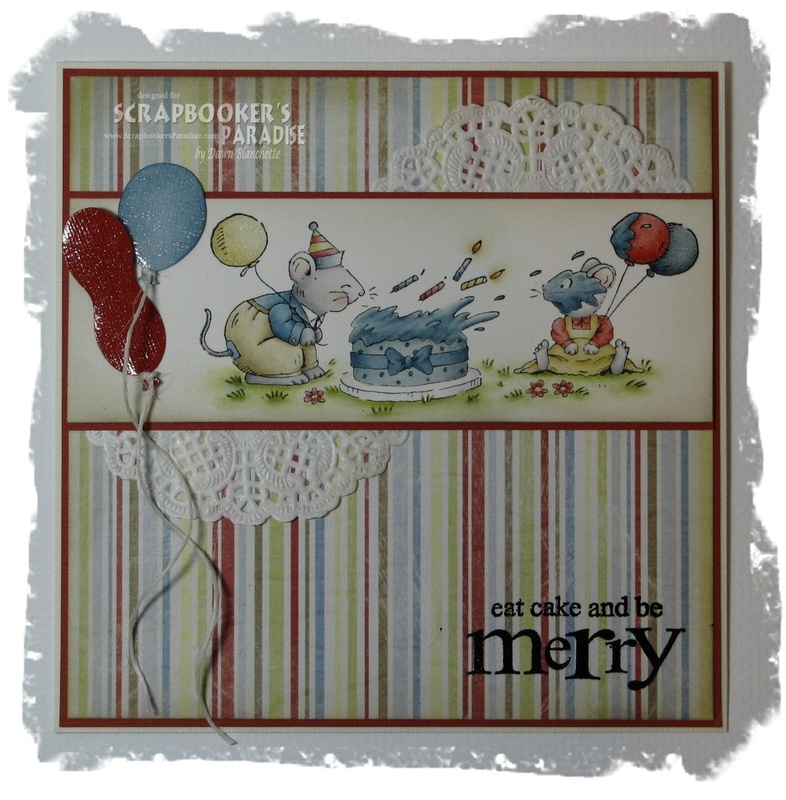 Lovely to see a card from this layout, and such a cute one too. Gorgeous papers and image and your bloons look fab! What a sweet card Dawn, this image is darling. I love the paper you used and the doilies are fantastic. That's just gorgeous Dawn. Love it.